Mary Russell Mitford is best known for her sketches of country life. She also wrote poetry and plays for the London stage. Her best-known writings were gathered into the book called Our Village. 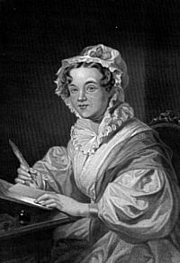 She published her memoirs, Recollections of a Literary Life, in 1852. Mary Russell Mitford is currently considered a "single author." If one or more works are by a distinct, homonymous authors, go ahead and split the author. Mary Russell Mitford is composed of 9 names. You can examine and separate out names.